Invisibly-set jewelry repairs - check out Signature Jewelry. 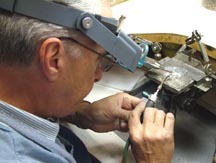 Jim Huesken using a jeweler's torch to solder. Jim is expert at sizing rings, soldering precious metals & setting diamonds using traditional bench tools & techniques. 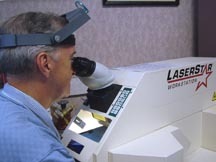 Jim Huesken using our state-of-the-art laser welder. Pinpoint accuracy allows work to be performed very near fragile and heat-sensitive stones. Also, eyeglass frames, costume jewelry and small, non-precious metal items can often be repaired.